Data from Chandra reveal that a pulsar in orbit around a massive star punched through a circumstellar disk of material, jettisoning a clump of material from the double star system at incredibly high speeds. A fast-moving pulsar appears to have punched a hole in a disk of gas around its companion star and launched a fragment of the disk outward at a speed of about 4 million miles per hour. NASA’s Chandra X-ray Observatory is tracking this cosmic clump, which appears to be picking up speed as it moves out. The double star system PSR B1259-63/LS 2883 – or B1259 for short – contains a star about 30 times as massive as the Sun and a pulsar, an ultra-dense neutron star left behind when an even more massive star underwent a supernova explosion. The pulsar emits regular pulses as it spins 20 times a second, and moves in a highly elliptical orbit around its companion star. The combination of rapid rotation and intense magnetic field of the pulsar has generated a strong wind of high-energy particles moving away from the pulsar at near the speed of light. Even though the clump is rather large, spanning a hundred times the size of our Solar System, it is also quite thin. The material in it has the mass equivalent to all the water in the Earth’s oceans. 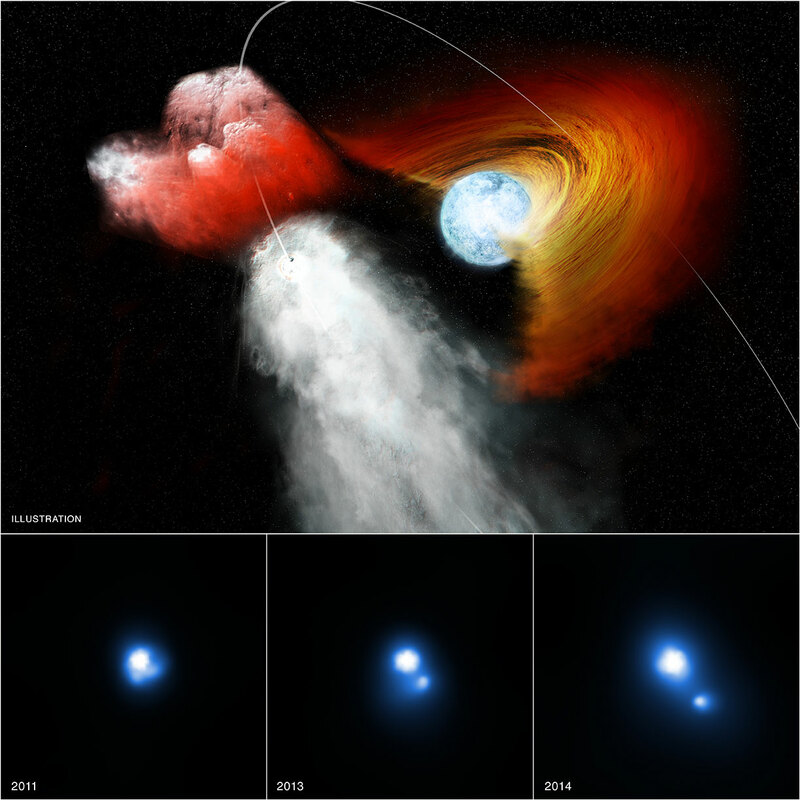 “After this clump of stellar material was knocked out, the pulsar’s wind appears to have accelerated it, almost as if it had a rocket attached,” said co-author Oleg Kargaltsev of George Washington University (GWU) in Washington, DC. Astronomers observed B1259, which is located about 7,500 light years from Earth, three times with Chandra between December 2011 and February 2014. These observations show the clump moving away from B1259 at an average speed of about 7% of the speed of light. The data also indicate that the clump has been accelerated to 15% of the speed of light between the second and third observations. The X-ray emission observed by Chandra is likely produced by a shock wave created as the pulsar’s wind rams into the clump of material. The ram pressure generated by this interaction could also accelerate the clump. Chandra will continue monitoring B1259 and its moving clump with observations scheduled for later this year and in 2016. Be the first to comment on "Chandra Reveals Pulsar Punching Hole in Stellar Disk"